Här kommer ett erbjudande från Sulas MC till Dig som är IMRG medlem! Dags att uppgradera dina pipor till ett härligt muller? This Thunder Stroke® Stage 1 Slip-On Exhaust produces a rich, throaty exhaust note and lets a Thunder Stroke® engine breathe more freely, unleashing additional power with enhanced mid-range torque and throttle response. For extra custom style, add your choice of Exhaust Tips (sold separately). This Thunder Stroke® Stage 1 Slip-On Exhaust produces a rich, throaty exhaust note and lets a Thunder Stroke® engine breathe more freely, unleashing additional power with enhanced mid-range torque and throttle response. For extra custom style, add your choice of Exhaust Tips (sold separately). Designed to seamlessly integrate with your Indian Motorcycle®’s hard saddlebags. Artnr. 2879532-156 Fishtail till ovan Chrome system, 8st i lager! 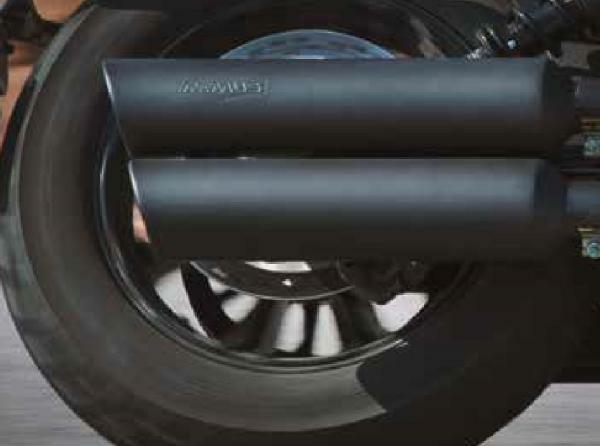 This Thunder Stroke® Stage 1 Slip-On Exhaust produces a rich, throaty exhaust note and lets a Thunder Stroke® engine breathe more freely, unleashing additional power with enhanced mid-range torque and throttle response. For extra custom style, add your choice of black Exhaust Tips (sold separately). This exhaust is from the collection of black Indian Motorcycle® Accessories that can be combined to give an Indian Motorcycle® a powerful and distinctive blacked-out custom style. Designed to seamlessly integrate with your Indian Motorcycle®’s hard saddlebags. Artnr. 2879530-266 Slashcut Black, 2st i lager! Välkommen in på en kaffe till Sulas butikerna & köp dina julklappar! Samtliga priser inkl moms & kan ej kombineras med andra rabatter/ erbjudanden.